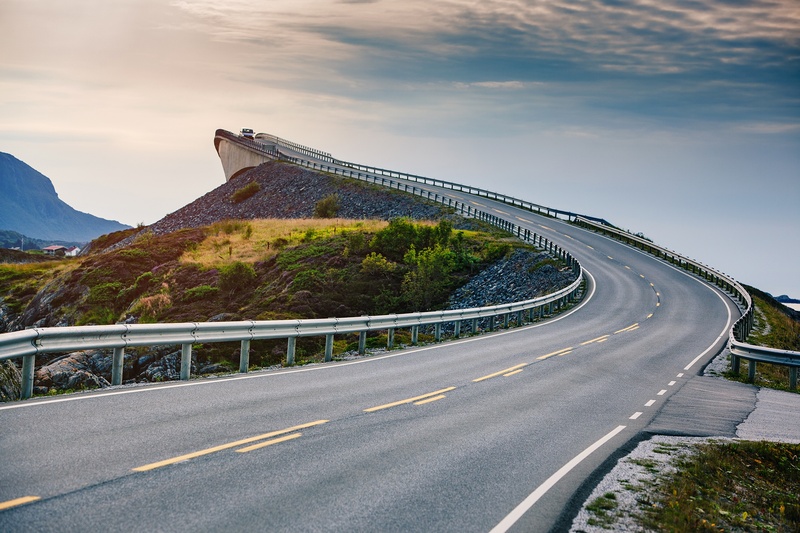 Over the next 12-year period (2018 – 2029) the Norwegian government has proposed to develop the infrastructure by spending 1 064 billion NOK on roads, railways, shipping, aviation, and public transport. The government explains that an investment of this magnitude is needed to stop the increasing deterioration on roads, railways and fairways. It is also required to develop infrastructure with a more long-term perspective to meet the needs of shorter travel time, higher safety, strengthened environmental protection, and to promote wealth creation. The published plan is the most offensive in the history of Norway. Construction industry worldwide and particularly in Europe may find great business opportunities. It is planned to spend 536 billion NOK on maintenance and new construction of roads. Several large projects have already been started to develop and reconstruct the main roads across the country. A total of 1 200 kilometres of new roads is planned, and 290 kilometres are going to be 4 lane roads. 100 billion NOK will, according to the plan, be spent on maintenance of the existing road network. 319 billion NOK is set aside for railroad. This is approximately 30 % of the total planned budget. The massive investment plans are supposed to transform the infrastructure to become more environmentally friendly by transporting more people and goods over longer distances safe and fast. Upgrades of already existing network and increase in the frequency of departure is supposed to make railroad the preferred way of travel in densely populated and urban areas. Long distance railroads operated by fossil fuel is reconstructed to operate using renewable energy sources. Norway has a long coastline and long traditions within shipping. It is therefore essential to maintain safe and efficient shipping. According to the plan, 31,7 billion NOK is set aside for further development and modernisation of the navigation infrastructure at sea and developing new quays and moles to make the goods transport more effective. 3.9 billion NOK has been allocated to aviation. Among the largest projects is a new airport in Mo i Rana and moving the airport in Bodø to give room for the urban development of central city area. The remaining 173,4 billion NOK is set aside for public transport, developing urban environments, running technology pilots and updating and adapting the legislation. The government believes that digitalisation and new technologies will radically change the way we travel and the effects travelling has on the environment and climate. Because of public investments suppliers within EEA are offered equal terms when participating in a tender. The Norwegian procurement legislation is mainly based on EU directives that Norway is bound to implement through the EEA-Agreement. In addition to the contracts awarded through public procurement, a lot of subcontractors and a sizeable workforce will typically be needed for large projects like these. Medium and small companies, which do not meet the requirements to attend a large tender, may find opportunities in quoting for subcontracts. Make sure your company is prepared and qualified to win. Magnus Legal has developed two useful guides for companies that want to enter the Norwegian marked. Download today. Inger Lise works with international tax law and accounting. She is a qualified accountant and authorized legal practitioner. Her specialty is international personal taxation and tax for foreign and international companies. She has solid expertise in advising Norwegian and foreign companies about the movement of labour across borders, VAT representation and optimization of international tax matters for individuals and companies. We share relevant and applicable information related to doing business in Norway. Our lawyers focus on the practical implications for our clients of relevant business legislation, such as how to tender, how to draft and win contracts in Norway, how to establish and operate a Norwegian business and how to comply with the tax regulations. New blogs are posted regularly. If you want to be up to speed, you are welcome to sign up for e-mail notifications of our blogs.